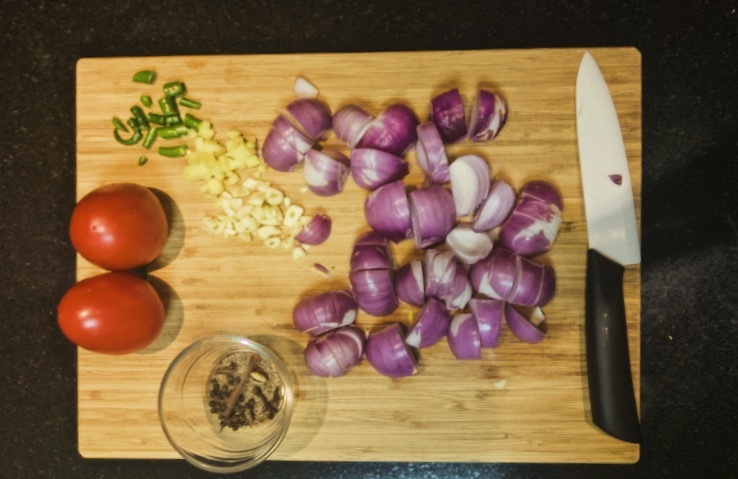 Cooking non vegetarian food was something I learnt pretty much on my own by trying out recipes from cooking shows, from my cousin and sometimes from my grandfather. Vegetarian food, on the other hand was being cooked at home all the time and I would learn recipes and intricacies by watching my mother or grandparents cook them over the years. So with non-vegetarian cooking, there was a learning curve. And like I’ve mentioned before, my sister is somewhat of an expert at Chicken and Mutton recipes in our family and is therefore my go-to person for any gyaan! But the problem so far had been that I would never follow her recipes to the T. The result was always unsatisfactory. Simple things like cooking a chicken perfectly was something that I would still struggle with! Until, I started following her recipes more seriously. 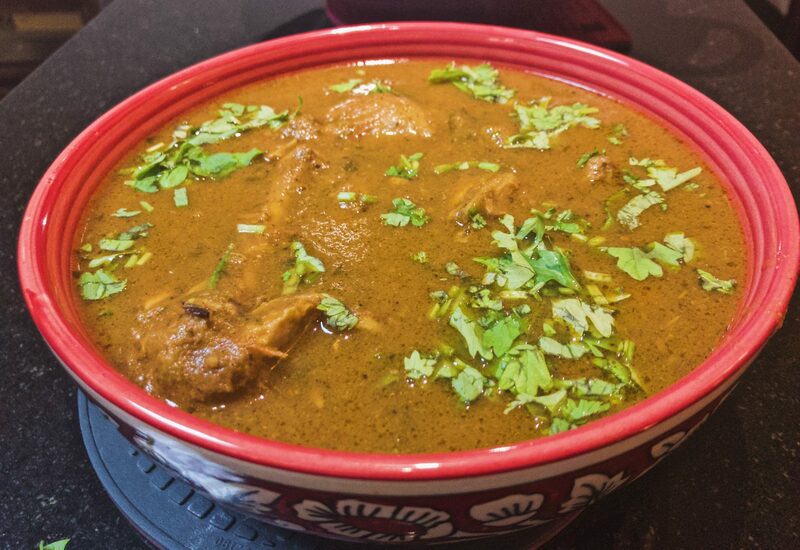 This North Indian Chicken curry is one such example of how a simple recipe if followed correctly can turn out to be an amazing dish. She has shared this recipe with me before but I probably never did what was asked of me: simplicity! I would be too enamoured by things like marination of the chicken, using unnecessary ingredients. 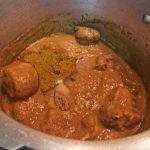 This, in my opinion, is that one Chicken Curry recipe that everyone who cooks Indian food should know! It’s simple and is great for every occasion; for a weeknight dinner to a dinner party menu essential, it shines everywhere! 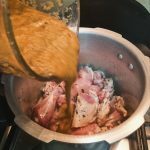 Here’s her recipe for North Indian Chicken Curry. Gather all the ingredients. Wash and pat dry the chicken pieces. If you are using chicken breast or any other big pieces, cut into inch cubes. Roughly chop the ginger, garlic and green chilli. Cut the onions and tomatoes into one eight pieces. You need be precise here as once we cook all these we will process them into a sauce. Pour oil in big wok or pressure cooker on medium high heat. Once hot, put the cloves, cumin seeds, cardamom pods and cinnamon in and wait for the whole spices to bloom. This should take 30 seconds if the oil is hot. Transfer the chopped ginger, garlic, chilli and onions next. Stir and coat all these in oil and cook till the onions start browning. Add the chopped tomatoes next followed by red chilli powder, salt, turmeric, coriander powder and garam masala. Mix all the ingredients and cook till the tomatoes break down to a mush. Once they are cooked they will start leaving some oil on the sides. Take this off heat and wait for it to cook down. Once cool, transfer to a blender. 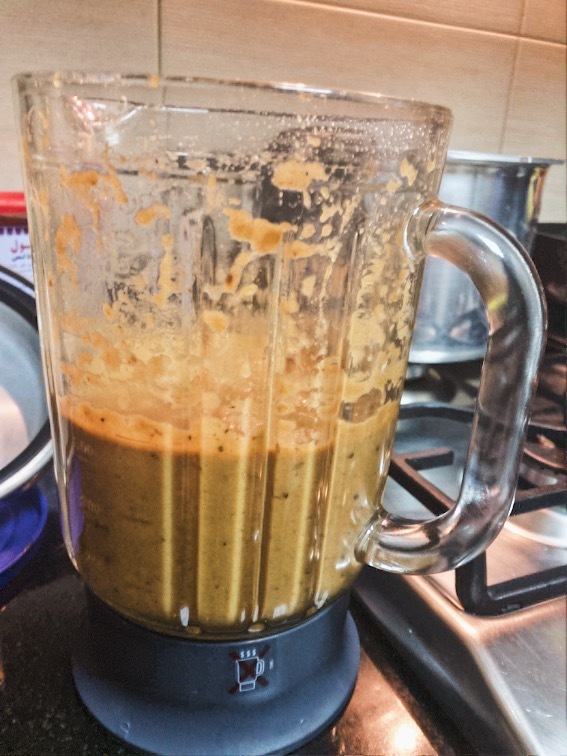 You can also use a hand blender, just be careful to blend it in a deep pot to prevent spilling. Blend the cooked onion tomato mix to a smooth paste. You may need to add a few tablespoons of water to work it into a paste. Place a pressure cooker on medium high heat and pour some oil in it. Once hot, add kasoori methi and cook it for 15-20 seconds. Add the chicken pieces next and stir. Cook for 5 minutes to cook the chicken till it starts turning white. Once that happens, add the blended sauce. 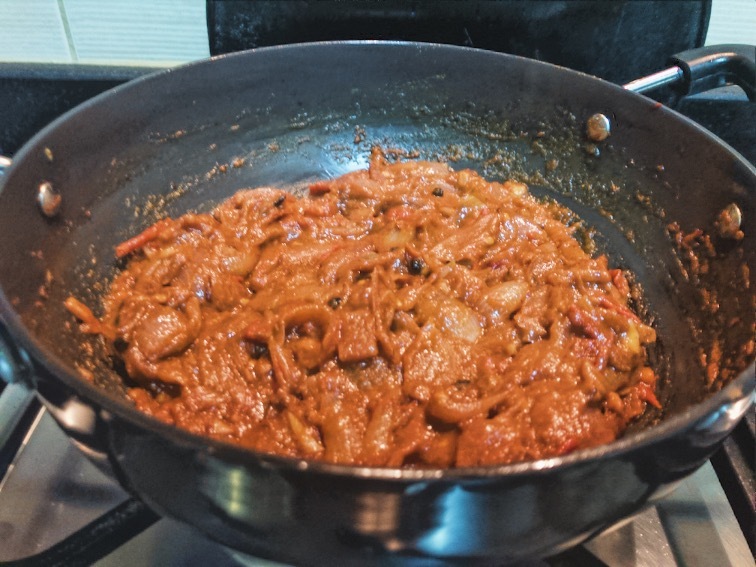 Stir it in and add a teaspoon of chicken masala and a generous ladle of ghee. Mix it in and cook for another 5 minutes. Shut the pressure cooker with the lid and pressure cook for 3 whistles. Once the pressure releases, open the cooker carefully. Sprinkle chopped coriander leaves. Serve with steamed rice, roti or naan! Gah! That looks so good! 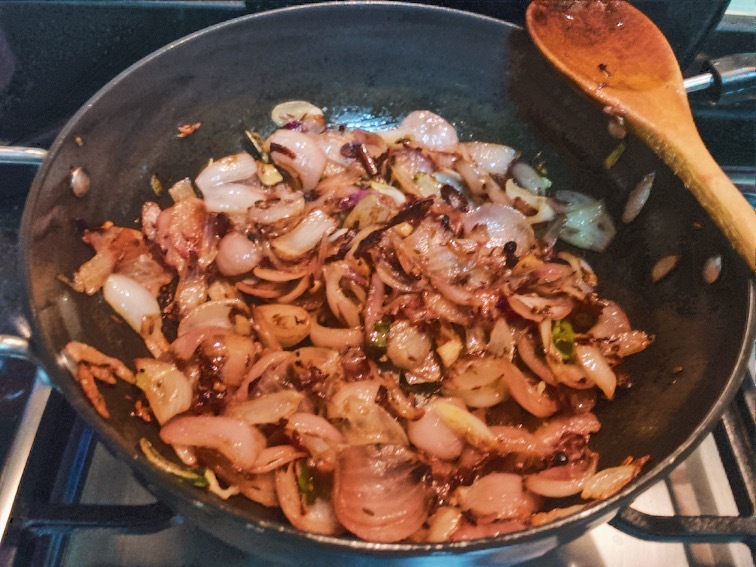 Although I only have fenugreek seeds, and I doubt I can find leaves… Although I believe you, I love going through my Indian cookbooks, all representing different regions, and creating very different curries. Maybe I have too much fun with all of the spices. I doubt I can have just one recipe, but I can’t wait to make this one in any case! But nevertheless, you could make the curry without the leaves. P.s. I’ve put up a recipe for Chaat masala finally. Wow! Sounds and reads well. Must try it one of these days.